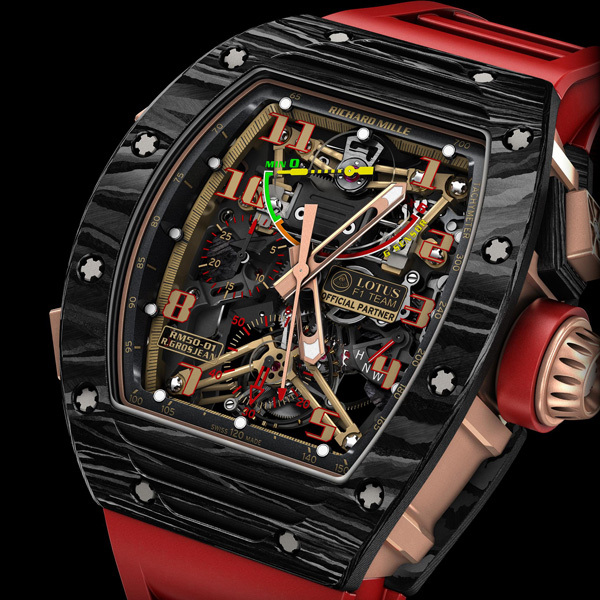 Limited edition of 30 pieces in NTPT® carbon with caseband in NTPT® carbon or red gold. CALIBER RM50-01: manual winding tourbillon movement with G-sensor, hours, minutes and chronograph with central seconds and 30 minute counter at 9 o’clock. Dimensions : 50.00 x 42.70 x 16.40 mm. POWER RESERVE Circa 70 hours (±10%). SKELETONISED TITANIUM BASEPLATE The baseplate has been finished in grade 5 titanium, a biocompatible, highly corrosion-resistant and remarkably rigid alloy, which enables the gear train to function effortlessly. The alloy is 90% grade 5 titanium, 6% aluminium and 4% vanadium. This combination further increases its mechanical properties, which explains its frequent use in the aerospace, aeronautical and automobile industries. The baseplate of the caliber RM50-01 has been optimised to achieve an extreme weight/resistance ratio. BRIDGES MADE IN GRADE 5 TITANIUM AND STAINLESS STEEL The bridges of the caliber RM50-01 are made of grade 5 titanium. To give more depth to the caliber, some bridges, such as the tourbillon and G-sensor bridges and certain components, such as the chronograph mechanism and the clutch rocker, are made of stainless steel and given a golden appearance by galvanization treatment. CHRONOGRAPH (column wheels in grade 5 titanium) The modern architecture of this new movement has allowed for a coherent and rational arrangement of each constituent part, avoiding unnecessary complexity and permitting the best possible use of the functions with technical solutions. For example, research was conducted into the geometric design of the column wheels that control the different levers in order to ensure the perfect, long-term, stable and simultaneous functioning of the chronograph mechanism, a feature that is essential for a high performance chronograph. G-FORCE INDICATOR This mechanism was designed to visually display the number of the G’s accumulated by the watch’s wearer during rapid deceleration. The hand and scale located below 12 o’clock indicate whether the deceleration is mild (green zone) or critical (red zone) for the driver. FUNCTION INDICATOR In a manner similar to a car’s gearbox, the function indicator allows one to see the winding, neutral and handsetting positions as the crown is pulled out. 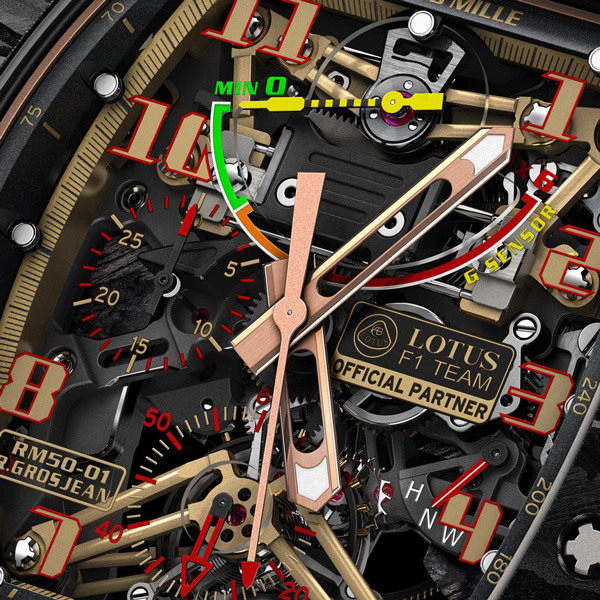 Each position is indicated via a hand at 4 o’clock displaying the following functions: W (Winding) – N (Neutral) – H (Handsetting). FREE SPRUNG BALANCE WITH VARIABLE INERTIA This type of balance wheel, which represents the ultimate in innovation, guarantees greater reliability when subjected to shock and also during assembly and dismantling of the movement, thus achieving better chronometric results over time. The index is eliminated, thereby allowing a more precise and repeatable adjustment using 4 setting screws. BARREL PAWL WITH PROGRESSIVE RECOIL This device permits an appreciable winding gain (circa 20%), especially during the start of winding. It also aids in the even distribution of the mainspring’s internal tension. WINDING BARREL TEETH AND THIRD-WHEEL PINION WITH CENTRAL INVOLUTE PROFILE The wheel with a central developing profile and a pressure angle of 20° promotes rolling movement more effectively, compensates differences between centers, ensures excellent torque transmission and a distinct improvement in performance. SPLINE SCREWS IN GRADE 5 TITANIUM FOR THE BRIDGES This permits better control of the torque applied to the screws during assembly. These screws are therefore unaffected by physical manipulation during assembly or disassembly and age well. EXTREME FINISHING FOR THE MOVEMENT Watchmaking expertise can be found throughout the caliber RM50-01, with drawn, polished, satin finished and soft polished surfaces all created by hand. 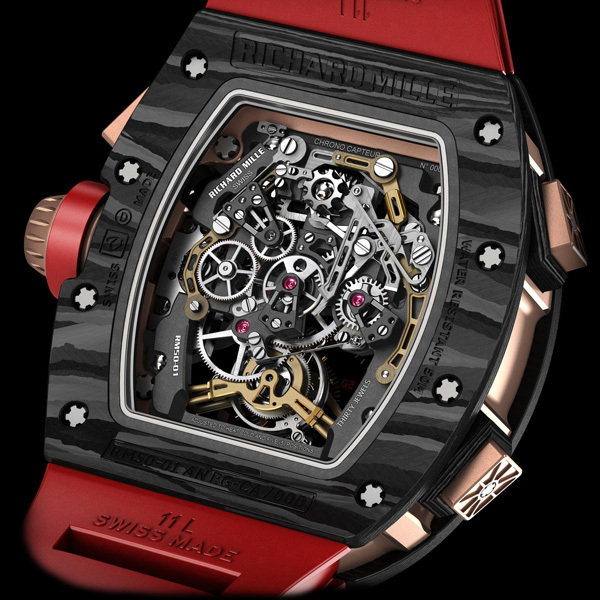 The complex shape of the tourbillon and barrel bridges in microblasted stainless steel are typical examples with their visible and non-visible areas completely soft polished. Then hand-beveled and rhodium plated before the teeth are cut. The various yokes are straight-grained, sanded on both sides and soft polished. This range of finishes additionally optimize the technical functions of the chronograph. CASE The bezel and the caseback are in NTPT® carbon, an exclusive material with a unique appearance. Its remarkable surface displays extremely regular undulations, as NTPT® carbon is composed of multiple layers of parallel filaments obtained by dividing carbon fibers. These layers, with a maximum thickness of 30 microns, are impregnated with resin then woven on a special machine that modifies the direction of the weft by 45° between layers, creating this distinctive visual effect that is strongly reminiscent of Damascene steel. Heated to 120°C at a pressure of 6 bars, the NTPT® is then ready to be processed on a CNC machine in Richard Mille’s Proart case factory. When compared to composite materials, whose exceptional physical properties are already well known, NTPT® carbon improves the rate of occurrence of breaking stresses by 25% and of micro-cracks by 200%. The case of the RM 50-01 is water resistant to 50 meters, ensured by two Nitril O-ring seals. 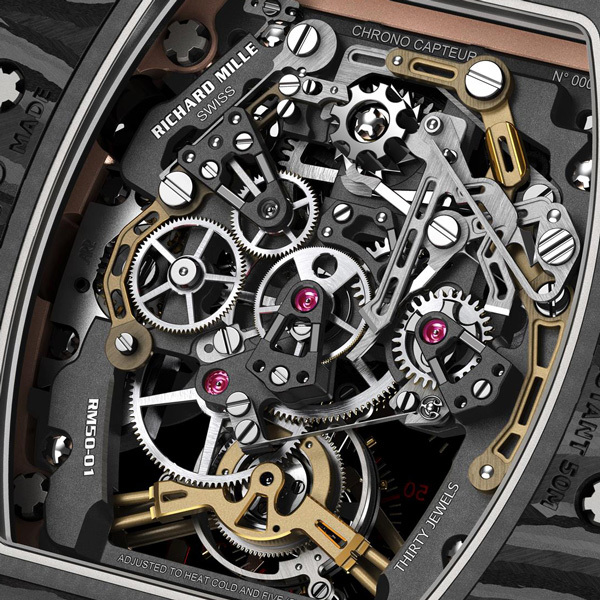 The case is assembled with 20 spline screws in grade 5 titanium and abrasion resistant washers in 316L stainless steel. TORQUE LIMITING CROWN This added security system prevents accidental overwinding of the watch, the result of which can cause damage such as breaking the winding stem or putting too much pressure on the barrel spring. FLANGES In black metal with index points filled with approved luminous material. DIAL In sapphire (thickness: 0.40 mm) with anti-glare coating (both sides), protected by 8 silicon clamps inserted in the outer and inner grooves.